“”Our Song” follows three young friends through the languid, anxious days of a summer in Brooklyn. 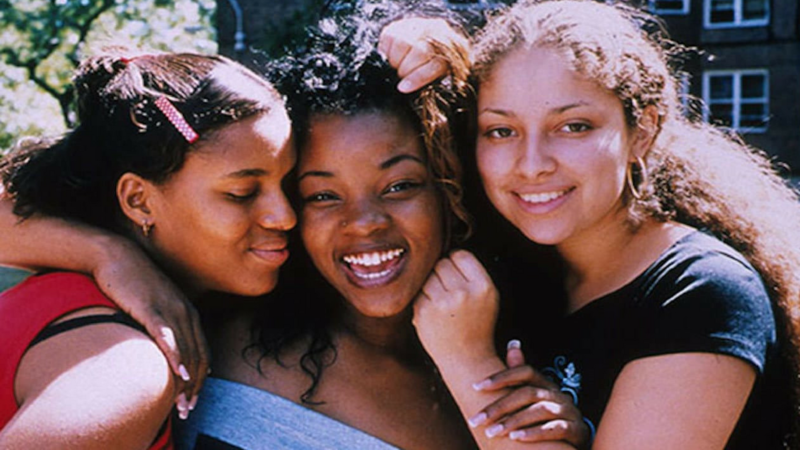 In the course of the film, which moves with the ease and warmth of its season and place, Lanisha, Jocelyn and Maria face the usual dilemmas and frustrations of teenage life in America — and in the movies — today. They shop (and shoplift); daydream about their futures, boys and exotic ice cream flavors; anticipate the coming of the school year; and navigate the treacherous tides of sexuality, social ambition and loyalty to one another. But ”Our Song,” written and directed by Jim McKay, is so unlike most Hollywood coming-of-age stories as to seem downright revolutionary. The three young women live in a housing project in Crown Heights, and their school has been shut down for asbestos removal. Maria, whose father is in jail, lives with her overwhelmed mother and her budding male-chauvinist younger brother. Lanisha’s loving, not entirely reliable father is a doorman in a fancy apartment building. Jocelyn works in a boutique and fantasizes about opening a store of her own, as a fallback in case her singing career fails to take off…. ”Our Song” was shot entirely on location, with a cast that includes residents of the neighborhood, most notably the Jackie Robinson Steppers, a real-life marching band to which the three fictional heroines belong and whose music and choreography provide some extra aural and visual excitement. But if the film has the look of a documentary, it has the psychological density and narrative coherence of a novel. Each of the three principal characters undergoes a subtle but decisive change and faces a life-defining choice at a scarily young age. Joycelyn (Anna Simpson) begins to gravitate toward a more popular, worldly group of friends and seems impatient with the passive, slow-moving Maria (Melissa Martinez), whose unexpected pregnancy is the dramatic linchpin of the film. Lanisha (Kerry Washington), who has been pregnant herself, tries to remain true to her friends while steering her own course toward maturity and independence. All of this is presented with passionate sympathy, with quiet good humor and almost entirely without melodrama. Watching Ms. Simpson, Ms. Martinez and Ms. Washington, none of whom has appeared in a movie before, you forget that they are acting, which means they are acting very well indeed. Free admission to ANGEL RODRIGUEZ at 9:15pm by presenting your ticket to OUR SONG at the box office!